Toolsbuff.com offers you this quick solution to become table one compliant under the new OSHA Silica dust regulations, you can get everything you need to drill in concrete with this bundle. 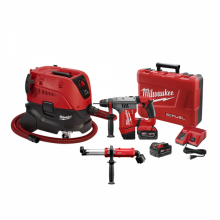 It includes the 8960-20 8 Gallon Dust Extractor, the 5261-DE M12 12V HAMMERVAC Vacuum Assisted Dust Extractor and the 2715-22 M18 18V Cordless FUEL 1-1/8" SDS-Plus Rotary Hammer Kit. Universal vacuum attachment system is compatible with standard hose sizes: 1-1/4", 1-1/2", 1-7/8", 2-1/2"
POWERSTATE™ Brushless motor: provides 3.3 ft-lbs of impact energy, 0-1, 350 RPM and 0-5,000 BPM. 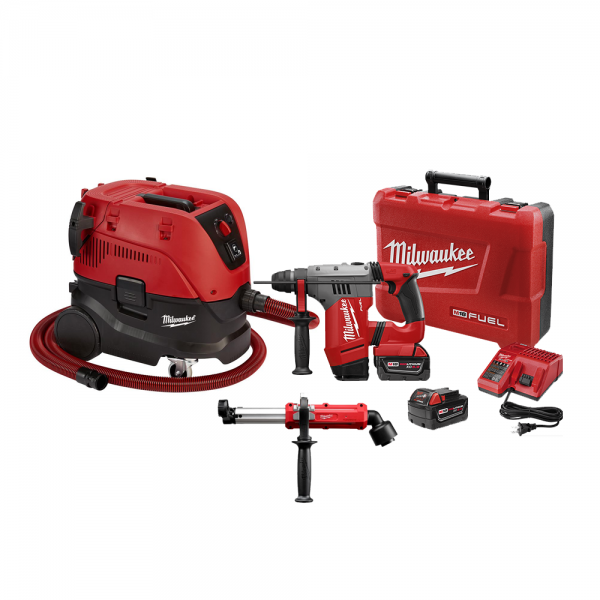 Click the button below to add the Milwaukee 8960-20 With 5261-DE & 2715-22 8 Gallon Dust Extractor Silica OSHA Starter Kit - SDS Plus Drilling to your wish list.